Enjoy 12 HOURS OF Free Movies. Just of recent we were thinking that the grand master of data GLO, has gone to bed, just about to close my eyes, only to see the masters, taking their place once again in data offering , in this special endless fun data, for fun and hour plus hours of premium world class entertainment on iflix. With iflix on Glo, you can pause, rewind, fast forward or replay as often as you like. No ads, just the good part, all for free with GloUnfairAdvantage. The Data revolution is here! Absolutely no need show rooms, but that doesn’t stop you from selling your market online for a moment. Thanks to #GloUnfairAdvantage #GloDataUnmatched. Giving you offer to enjoy unbeatable Data offers and share amazing moments online with the #GloUnfairAdvantage. Dial *777# and get 12.5GB to browse, stream, upload and do more for as low as ₦2500. Choose a preferred plan by Dialing *777# and start enjoying this offer. 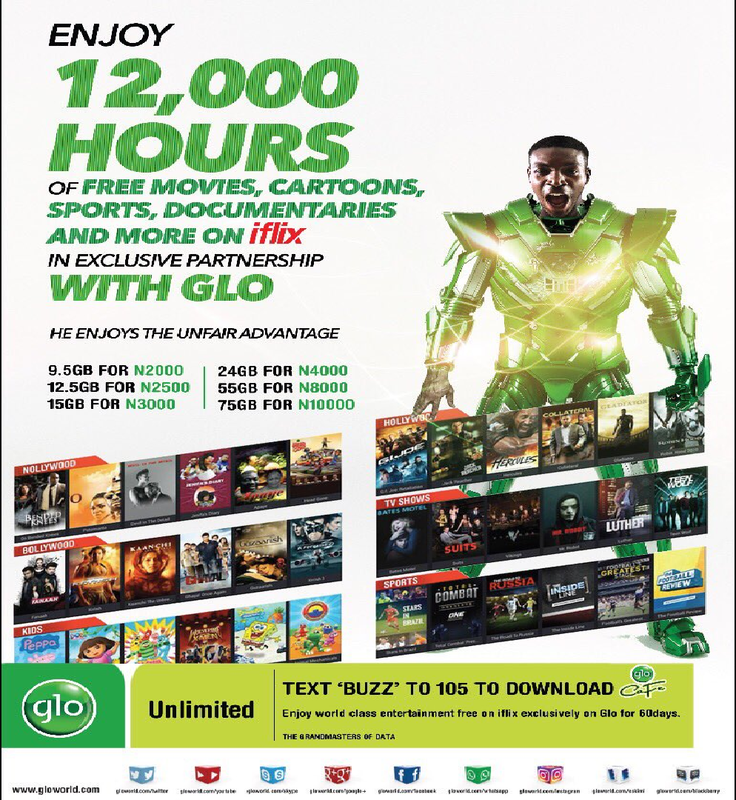 For those who have smart television and all heavy traffic users, you ‘v got an unbeatable plan from Glo. Available FREE for 60 days to all Glo customers & N100 per month thereafter. With N500 data plan and above and get YOUTUBE Free capped at 2.5GB between the hours of 1.00am to 5.30am daily on GloUnfairAdvantage. All customers with higher data plans will get iflix included as part of the Data bundle subscription. Download the movies on any device (Mobile, Tablet or desktop) and watch later in offline mode. Customers can create their own playlist. Users can continue the watching the movie from where you left the last time. Application is available on both iOS App Store and GooglePlay Store. Web/WAP version also available for tablets and desktops (www.iflix.com/glo). You’re in control for the first time ever in the history of Nigerian Telecommunications, with a full 360-degree solution to empower subscribers to manage their mobile accounts with convenience and ease. Furthermore, the apps , is an exclusively one stop entertainment shop with unfettered access to a plethora of content covering video, music, sports, comedy, celebrity news and gist. · Fastest way to BUY, SHARE & GIFT data. · Most convenient way to Borrow Call credit and Data. · Easiest way to RECHARGE any Glo account. · Accessibility to contact call center executives, raise service related requests, chat with agents etc. · One stop shop for all entertainment needs with 2,000,000+ songs on Glo Music café, over 10,000 Music videos, Comedy & sports on Glo Video café and a world class gaming portfolio on Glo Games café. · Direct access on the go for Glo Laffta fest and Mega music concert with latest highlights. · Quickest way to PAY Post pay bills. Enjoy unbeatable Data offers and share amazing moments online with the GloUnfairAdvantage. The Glo Café app is available for both Android and Apple devices. App is FREE of charge and is available on Google Play Store and IOS App Store. for android users download app here, Apple users download here. ← Buy Data In Minutes To Access The WORLD. Great post, is the deal only on Nigeria?